April is National Distracted Driving Awareness Month. To promote teen driver safety, UVM Medical Center is offering the TXT U L8R program to your students and their families. Everyone in encouraged to participate — even you! Texting while driving has quickly become one of the greatest hazards on the road. It causes 1.6 million car crashes and 330,000 injuries per year, and approximately seven teen deaths every single day. 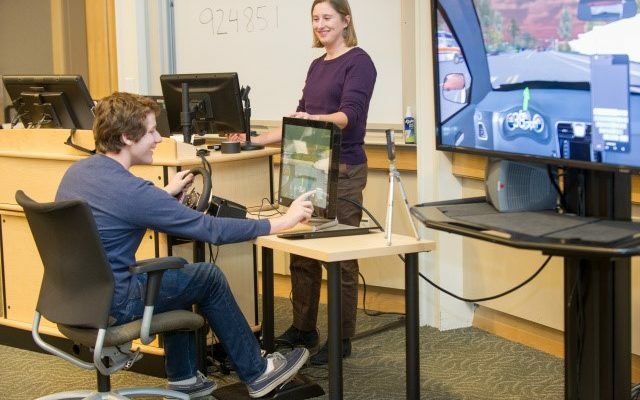 That’s why the UVM Medical Center and the Clinical Simulation Laboratory at the UVM College of Medicine created “TXT U L8R” a unique program designed to discourage individuals from texting while driving. Key elements include a demonstration of an advanced driving simulator, presentation of a realistic trauma scenario, a testimonial from the victim of an accident caused by a teen driver who was texting, and a demonstration of several smartphone apps designed to prevent texting while driving. Funding is available to assist with transportation costs. Wednesday, April 4th, 6-7:30PM at UVM Medical Center, UVM Medical Education Pavilion, Sullivan Classroom. Register (and find a map and directions) at: https://www.uvmhealth.org/medcenter/event/txt-u-l8r-spring-program or call to register at 802-847-7222. For more information about the event or funding for transportation costs, contact Chrissy Keating, Injury Prevention/Safe Kids VT Coordinator, (802) 847-2291.